West Bay, Bridport, Dorset - Old Bridport Harbour. The old inner harbour at West Bay (Bridport Harbour) in its current form, dates from the early 19th Century. 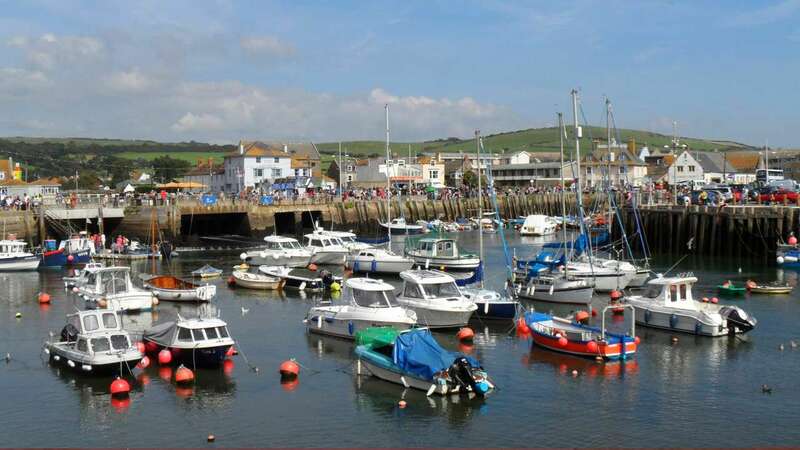 However, there has been a harbour at West Bay since the 13th Century. Shipbuilding also took place during the 18th and 19th Centuries. The harbour is now used for moorings for a small number of fishing vessels, but mainly for pleasure craft. Today, children can often be seen on holiday around the harbour with their crabbing lines. The small slipway is now only used for small dinghies. Dogs must be kept under control and on a lead at all times. Owners must remove any faeces caused by their dogs. The whole of West Bay operates a clean zone, regularly patrolled by wardens. Dog owners who do not clean up can face fines of up to £1,000. Bins are provided.